15.7 inches/40cm and 3 pounds/1.35kg the size of a medium cabbage! Hiccups!! He has been having the hiccups at night time around 9pm when I’m lying in bed. It’s so sweet to feel, when I’m looking down at my belly the hiccups are coming from the right side halfway down the belly. It feels similar to a heartbeat and lasts about 5-7 minutes. He has now done it 3 nights in a row and Mark and I get very excited! He is also moving tons more and now you can really see it through my clothes. Mark has been working 15 hour plus days this week getting his (amazing!) film finished and Bodhi had decided that he likes a 6am wake up every day so I’m just totally knackered right now and it feels non stop! I’m also starting to get round ligament pain which takes my breath away sometimes. The surprise baby shower that my best friend Annabelle threw for me Sunday. I had actually completely forgotten about having one with this babe but then this past week I started getting these cryptic texts and I started to realize that maaaybe something was going on! Annabelle themed it “Australiana” and even went to the flower market to pick Aussie flora and fauna to scatter. She placed blanket and had white helium balloons tied to little weights next to the picnic area. All my friends thought it had been professionally arranged but Annabelle (who is also my stylist) is just so incredible and has such a brilliant taste when it comes to decorations and themes. I was so moved! I can’t thanks her enough. I had so many beautiful Mamas, Papas, kids, babies and friends show up. The weather was perfect and it was a highlight of my year! The day before my shower on a Saturday we also had 3 parties to attend! Our friend Rivers 3rd birthday at the Griffith Park Merry-Go-Round, then our friends Joey and Ryder’s 5th birthday “splash party” then lastly Sarah Olsen’s little birthday gathering at our friend Anna’s house. 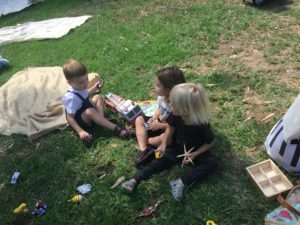 Bodhi and Wyatt play so incredibly well together, they just LOVE exploring and interacting, they bounce off each other so well and always have such a blast creating adventures. It was the second weekend in a row making such beautiful memories with friends and kids! These past few weeks have truly been magical. Just the one workout with Jeff @la_mindset this week! I’ve posted it here instead of at the end of this update this week! I Am Immortal add Cacao from Cafe Gratitude, Green Juice (kale, lemon, cucumber, spinach) and a vegan gluten free muffin. Kale and sea vegetable salad or a kale, avocado, almonds and tempeh salad. Shrimp dumplings, spicy peanuts, Passionfruit Boba tea, cheese pizza, kale salads, vegan spinach artichoke dip. Impromptu kisses in the rose petal and lavender bath with the baby, Bodhi asked him “do you like swimming? 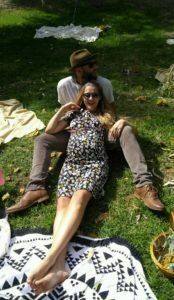 I will teach you kick and paddles when you come out!” Also Bodhi’s preschool friends have been so excited about the belly and always want to lift my shirt to see him! one little boy sings to him and one little girl always gives the belly big hugs and whispers to him that Santa will bring him lots of presents! Nothing again this week, I really went to town with food this week haha I’m getting hungrier and wanting to move less so hopefully I’ll find a happy medium! Kale salads of every kind! I am LOVING my greens right now especially when paired with a lemon flavored dressing, it’s been so lovely. Also crushed ice again, warm baths with lavender and lemon oil. I’ve been trying to have a bath each day and I listen to my new fav podcast The Birth Hour which is 1-3 birth stories per episode. They’re so beautiful and inspiring. Bodhi came 11 days early and so now as I approach my last 9 weeks I’m realizing that I could have as little at 7 weeks left being pregnant, so I’ve been clocking in the Bodhi/Mama time so much, really being present and playing with him. I’m having a lot of “Bodhi led” moments. I’m just really craving being with him (now I’m crying writing this!) Yesterday we played on the bed for 1.5 hours just us. We played “Rescue” where he would pretend to fall in mud and I’d rescue him then I would pretend to be stuck in the mud and he would rescue me, he was laughing and kissing my nose and face whenever he rescued me. It was such an incredible time together and we would have these moments where we would be still for some time in each other’s arms just looking at each other, it felt to me like this knowing feeling between us, that we both feel and sense change coming in each of our lives (letting the tears flow right now!) I’m so emotional about it but I can reflect on how confident I feel in this love and the secure bond Bodhi and I have created, its so deep that I know it’s only going to grow and expand to welcome a new kind of love and experience to include this new precious baby and whilst the dynamic may shift it doesn’t have to mean a mourning of what was but a celebration of the evolution of family and to embrace all that wonders that come with that. 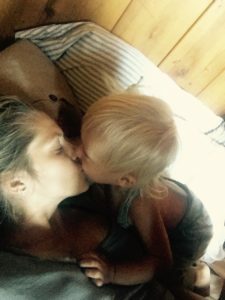 Mamas/Papas can you relate to these feelings going from one child to two?